Would you like to practice on Harley Street, the most prestigious medical address in the country, but have found the expense and commitment involved in taking a lease on your own Harley Street consultation room prohibitive. Then, think again. 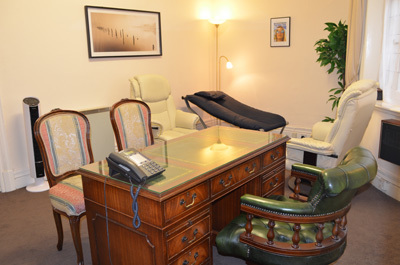 The answer is to use our Harley Street consulting rooms to rent on a sessional basis. If you're just starting your business or see a small number of clients a month in Central London, then why not join the Westlake Clinic. We offer a cost effective alternative to renting your own Harley Street office space. In our eighth year, the Westlake Clinic is a well established alternative health organisation, promoting the very best care on Harley Street. Download our brochure. Each session is 4 hours in length and the costs are very reasonable at only £55 per week inclusive. Your initial commitment is only two months and thereafter, your agreement is based on a month by month basis. Harley Street has a worldwide reputation for a centre of medical excellence, where the best specialists practice - the ultimate address for any practitioner. Even if you're not based in London, the benefit of practicing in Harley Street should not be underestimated. Many of our therapists have seen an increase in business at their existing practice, due to the 'Harley Street effect'. Our spacious consulting rooms are ideal for a range of therapies, including hypnotherapy, counselling, homeopathy, nutritionist, psychotherapy, complementary therapies, psychiatry, life coaching, doctor's consulting room, bodywork, massage, etc. In addition to renting a consulting room, all practitioners have their own profile page on the Westlake Clinic website at no extra charge. Centrally located in London on Harley Street - just a few minutes walk for your clients from Oxford Street. The Harley Street Consulting rooms to rent are located at 1-7 Harley Street, London, W1G 9QD. Copyright © 2007 Harley Street Consulting Rooms All rights reserved.